haha yeah, it's pretty ridiculous. you should see all the crazy accessories for the ARs that help you manipulate the take down pin and mag release. 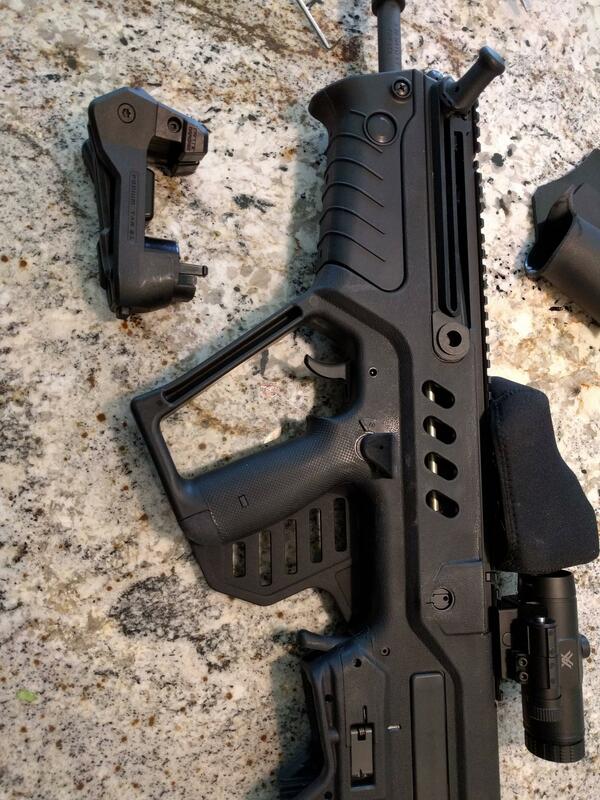 This looks amazing and I'd love one for my Tavor. I just made a grip wrap out of Kydex and it looks terrible. This thing looks like it was designed to be apart of the gun. That is great if you want to run a fixed mag on an AR to keep your pistol grip and collapsible stock. The grip wrap turns the gun into a featureless rifle and allows you to have a detachable magazine. Fixed mag on the Tavor doesn't work so well. I even hated the bullet button on mine since i am left handed and I went with the grip wrap to go back to the standard mag release. Yes, the laws are confusing and written by a bunch of brain dead gun hating commies. I've posted the items up on Shapeways for those of you who've messaged me. I had a Kydex "fin" made for mine, but yours looks better. Yeah, I was going to go the kydex route, but since we have that removable buttcap I wanted to make something that look like it's part of the gun. Thanks! Ordered a lefty version. Only issue is you can't unlock the Tavor right when you download the game. You need to save up 30000 points from disassembling other firearms. Took me 2 days to unlock the Tavor, but its worth it since the 3D model is very good, you can click to hide parts and view any internals in action, activate a cut out mode, and x ray mode too. I use a Mac and got the game for free from the app store (only for computer not iPhone/ipad) but its available online for PC also. Not sure if PC also has an app store but do know for certain there is an online browser version of the game, and its also available on Steam for PC download. Im not sure if you can save progress on the web browser version so would recommend downloading it since its free. Crap like this makes be believe Congress and Trump need to remove a state's ability to regulate firearms and prohibit assault weapons bans and magazine limmits. Yeah world of guns is amazing lol. I've used it for reference on my firearms when I was going beyond a field strip to a total dissasembly. Lots of my manuals leave many questions in my head of how to disassemble or reassemble intricate parts that I forgot how they came apart. It's been very helpful to understand my toys. I like being able to compare platforms, their gas systems, and fire control mechanisms. I remeber comparing my tavor to the ak-47 (which is prohibited in Canada and I would never be able to handle) and thinking how similar their operation was to eachother but in different form factors. You mean like a federal law preventing the ability of government to limit your ability to own or carry firearms? Huh, if only the founding fathers had thought of that. 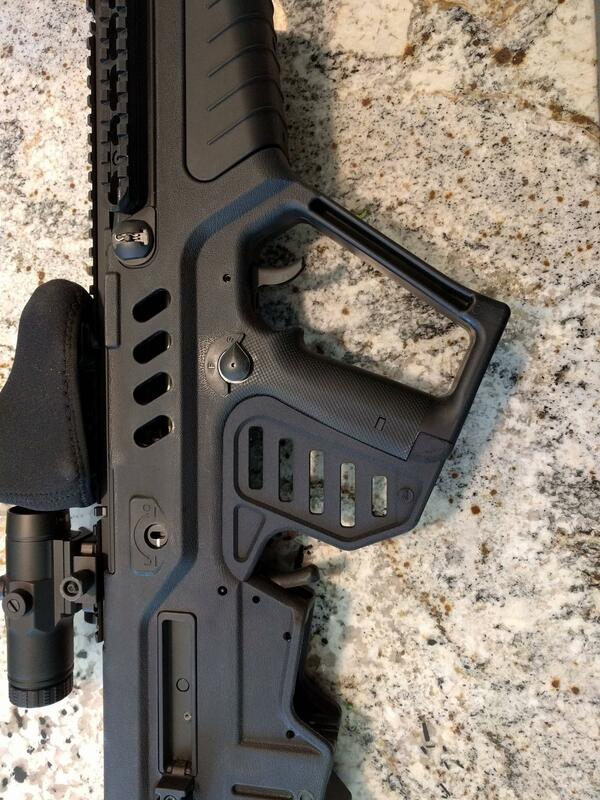 I don't have P/P .Can I send you a Cashiers Check for a black Leftie Tavor grip and a black Leftie safty thumb post ? Just reply as a message to me with your address and I'll send it out. Bplvr, I think Shapeways takes credit cards IIRC, do they not? I'm out of town with limited access to internet so I'll try to double check later. every time I use my card on the net it gets hacked and then I hafta get a new one .no more. For what it is, and why it is there, that looks awesome! I am in Cali as well and have a black kydex wrap, hah... Make a couple, I'm sure you could sell em. If the price was right I'd be happy to get one from you when you have it completed. Edit: Derp, saw the link to order. No FDE variant, bummer. Thank you for doing this though and making it available. Very cool. If you can get a black lefty and the thumb rest I'll pay you in advance for them. Oh hey this thing works left handed.